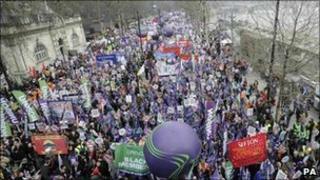 The number of protesters in London on Saturday has been estimated anywhere from 250,000 to 500,000. So is it possible to count? No one knows exactly how many people joined the march and rally against spending cuts. As the march finished in Hyde Park, the Trades Union Congress, which organised the event, estimated there was about 250,000. On the following day, they were saying it was between 400,000 and 500,000. So how do they count? "It's an inexact science, which is why we're not making any very, very accurate claims," says Nigel Stanley, head of TUC campaigns. "We have been piecing together information from yesterday and think we're close to half a million people." There are two ways of estimating numbers, he says. One is drawn from having a rough idea in advance of the capacity of streets in the area where people gathered for the start of the march. This advance planning involves studying very precise maps with measurements of streets, and then multiplying the width by the length to get the area, he says. Then you apply a rule of thumb that three people per square metre is comfortable and four is like a rock concert. On Saturday, it was probably about 3.5 per square metre, organisers estimate. This calculation, helped by having a TUC representative in the police control room looking at CCTV, prompted the early and more modest estimates, says Stanley. But then a second stage of calculations is required, to allow for the fact this is a moving group, with many people joining the march late. This requires some knowledge of how long the march takes to pass a particular point in the road. "We know it took more than four hours to pass any point, and that the crowd was quite dense. A combination of these two ways, plus conversations with the police and others experienced in this, led us to revise the figure from 250,000 to nearer 500,000." There are ways of doing it. Take a picture of the crowd, overlay a grid on it, count how many there are in the grid and multiply up. In a march, count how many there are across each row, then how many rows make up, say, 50 yards, then multiply by the length of the column. There are loads of cameras, which ought to make it easier. Some people have worked out algorithms for counting from surveillance images. It would be better to always supply a caveat of a 20% margin of error but the media demand for accurate numbers is an impossible one to meet, he adds. The TUC's technique echoes what has come to be known as the Jacobs Method, named after Herbert Jacobs, a professor of journalism at the University of California in the 1960s. He estimated the numbers taking part in one of the Free Speech Movement protests in Berkeley, by measuring the concrete sections in the plaza, estimating the crowd density and counting how many sections were filled. But there is a political dimension to the numbers game, and organisers of any demonstration are always open to accusations they inflate the numbers for their own ends. That's why the police sometimes estimate numbers too. At a demonstration in London in 2003 against the Iraq War, organisers said nearly two million people took part, although police put the figure at 750,000. At the weekend, the police were not making any claims about numbers because they were happy with those being supplied by the TUC. A Metropolitan Police spokeswoman said the force only does so when it disagrees with the figures being given by those organising an event, and their counting methods rely on experience more than science. "We don't normally give out numbers and would point people to organisers, it's their march. But we do know what certain areas can hold in terms of people. For example, on New Year's Eve, we know the strip along the Embankment by the London Eye holds a certain number. "We can't be that accurate unless we stand there counting but with those kinds of numbers, you can't do that. Experienced officers get an accurate idea of what they are looking at but we wouldn't usually go on the record with it." The Taxpayers' Alliance, which campaigns against wasteful spending of public money, says it had no comment to make about the numbers reported to be at Saturday's event.